We were half way through our new chicken house project when Hurricane Irene blew through and brought everything to a screeching halt late in August. It meant putting a lot of things on the back burner and immediately dealing with new problems that the storm laid in front of us. We still have a ways to go (we need a new roof on our house, the horse barn is still under repair, my car is awaiting its appointment with the bosy repair shop, and we still have the majority of a huge fallen oak tree to chop and stack in our backyard) but we've finally gotten to the point where we can slip in a weekend here and there toward working on pre-storm projects. 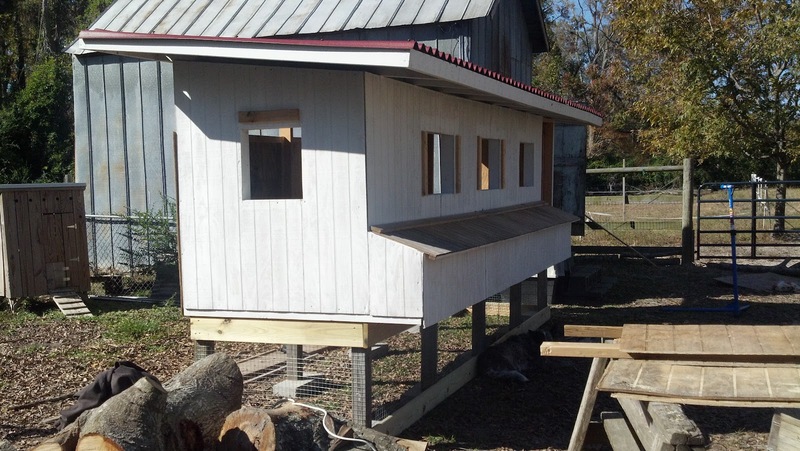 Top of the list is the new chicken house. Because we had to take down the big pen after the storm thanks to the fallen monster oak tree, the entire flock has been divided into two smaller pens (a tractor and a breeding pen). It's adequate but borders on cramped quarters so we take extra care to free range them as much as possible. Several of them stopped laying abruptly after the hurricane and then kicked the egg making back into gear about 3 weeks later. I think the weather mixed with the forced change in habitat caused the egg layoff, but it seems now they've adjusted and are getting back to normal (just in time for shorter days and molting, so now egg production is naturally declining... of course). 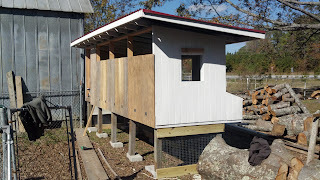 Our new hen house is nothing short of awesome in my opinion. We've learned a lot about chickens and their natural tendencies, and thanks to The Boy's handy carpenter skills, I think we've designed the new henhouse quite well. It is made to house far more than the flock we have now so we can continue on our path toward breeding in the future, and it's one sturdy beast so it should last for a long time. It's still under construction but after a couple more weekends of work we should be all set to move everyone in. Ventilation and plenty of it. In eastern NC we deal more with heat and humidity than we do cold so we have included lots of venting and lots of options to increase/decrease the vents as needed easily throughout the year. Drop down panels all across one side that allow full and easy access to the inside of the house for cleaning, etc. It's also strong & big enough that we can get around inside it if needed. Lots of windows with closing shutters so we can use them for ventilation and sunlight. 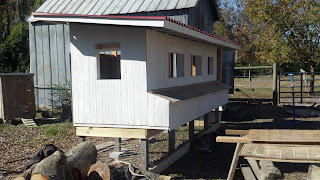 Entire house is raised 2 feet off the ground which will not only provide flock with shelter/shade underneath but will also allow us to easily clean manure from under it (henhouse floor is hardware cloth so droppings fall through to the ground). Manure is composted. Floor in henhouse is hardware cloth to allow for maximum ventilation and to allow manure to fall through but we also have the option to cover the floor with thin sheets of plywood and wood shavings during the short winter months to keep the birds warm. 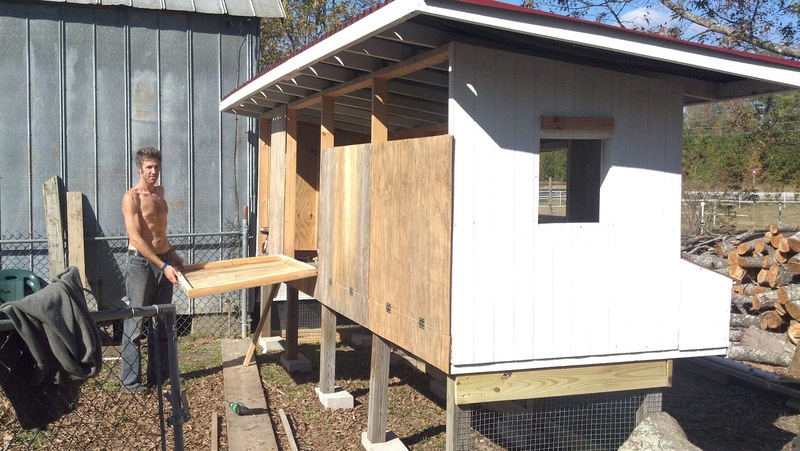 Extra nesting boxes will deter arguing over boxes and give more submissive hens space away from alpha hens. 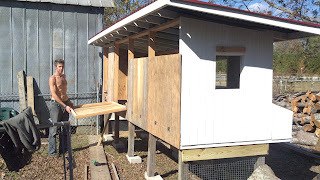 Full access to nesting boxes make for easy daily egg collection and cleaning. Wow, that is one serious coop! Nice work. Hi Mitsy, thank you! It's been a project long in the making. Hopefully this will be the last one we build.